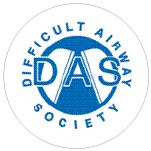 The Difficult Airway Society (DAS) publishes evidence-based, peer-reviewed guidelines for unanticipated failed intubation.1 These guidelines outline relatively simple airway skills, several of which are listed as core competencies for trainees by CICM, ACEM and ANZCA, and all of which are covered in the CCAM course. 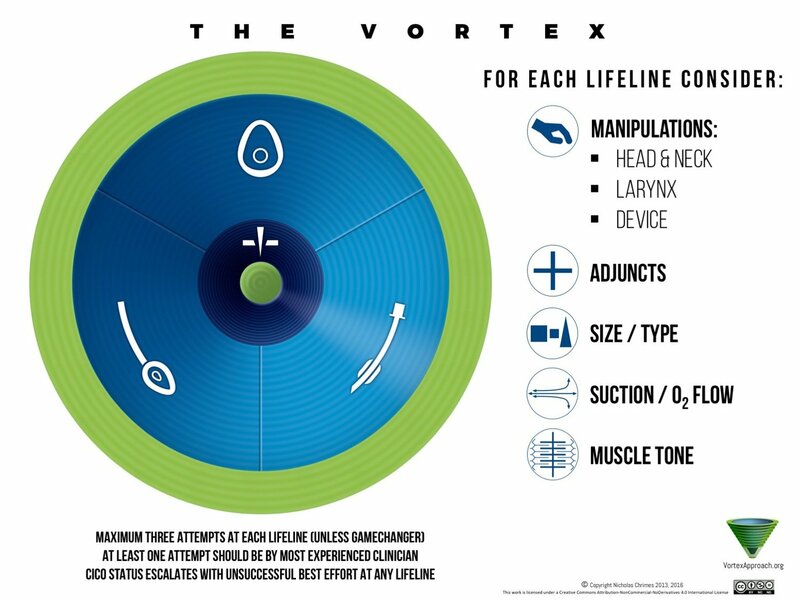 The Vortex approach is a cognitive aid which moves the intubator between three broad airway management strategies: oxygenation via a face mask, supraglottic airway device (SAD) or tracheal tube. It recommends that when an optimal attempt has failed using each technique sequentially, an emergency surgical airway is performed. The DAS and Vortex algorithms are relatively simple and straightforward, which makes them easy to remember. However, it is clear that clinicians still find it difficult to progress through these algorithms in stressful situations. This is due to a multitude of factors, such as the high stakes involved, but is also due to the fact that failed intubation is a relatively infrequent event. 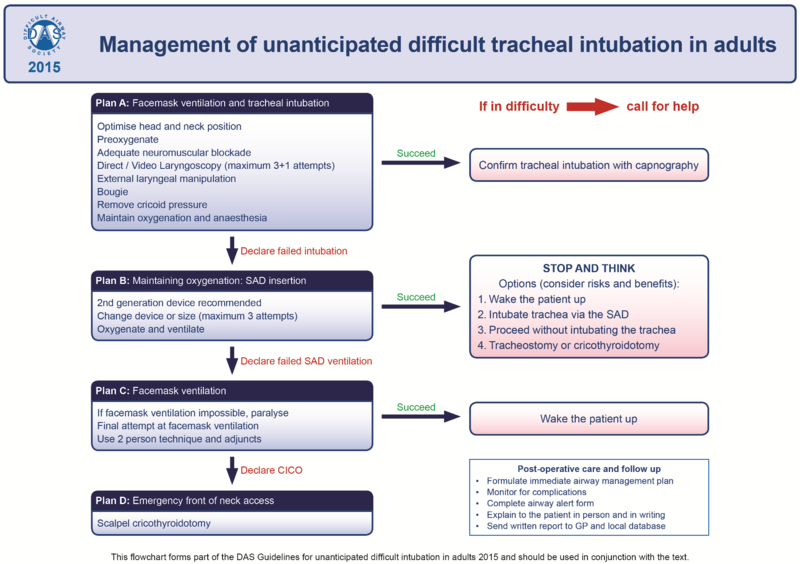 As a result, the skills and behaviours required to follow an airway algorithm to its successful conclusion need to be practised and rehearsed. However, technical skills are only part of the story. As a team of clinicians, we also need to be trained in the attitudes and behaviours needed to manage a crisis. These traits are variously known as ‘non-technical skills’ or ‘human factors’ and training in this area often termed ‘Crisis Resource Management’. The tragic case of Elaine Bromiley gives us compelling evidence for the importance of human factors and in health care. This 37 year-old mother died during anaesthesia for routine surgery in 2005 when the Difficult Airway Society guidelines were not followed when it proved difficult to intubate her trachea or ventilate her lungs. The independent review which followed Elaine’s death concluded that the technical skills of the anaesthetists concerned, facilities and staffing levels were all more than adequate and that human factors such as poor situational awareness, decision making and communication skills, and a lack of adherence to a difficult airway algorithm were responsible for her death.8 Elaine Bromiley’s husband, Martin, an airline pilot and a ‘human factors’ trainer for the airline industry, has responded to this tragedy by founding the Clinical Human Factors Group, an independent organisation that promotes awareness of and training in non-technical skills (www.chfg.org). 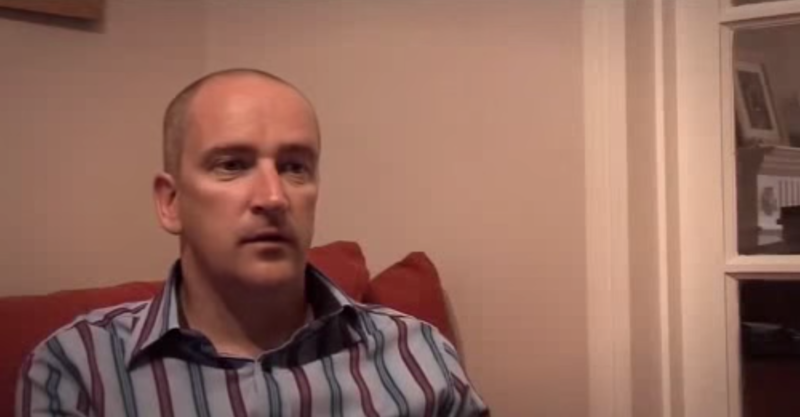 Please watch Martin’s video below for an account of Elaine’s case, and how Martin suggests we respond. The DAS guidelines place a heavy emphasis on planning: Plans B, C and D should be decided in advance so that they can be implemented quickly if Plan A (the primary technique) should fail. The guidelines stress that oxygenation takes precedence over everything else during the execution of each plan, and that the best available help should be sought early in cases of difficulty. -There is emphasis on crisis resource management, teamwork and regular rehearsal of the algorithm as a team. These algorithms are designed for peri-operative use rather than the critical care environment. As such they are not applicable to all critically ill patients. When planning to intubate a critically ill patient, careful consideration must be given to whether the patient can be woken up if the airway cannot be secured. This option is often not available in very sick or badly injured patients, committing the team to progression to a surgical airway if all else fails. 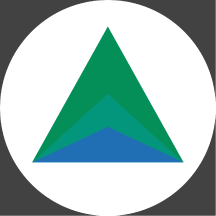 The Vortex approach is a cognitive aid designed to help with situational awareness and decision making during difficult airway management.10,11 The main justification for the approach is that in times of stress, clinicians need very simple decision rules which are goal focused, rather than technique focused. 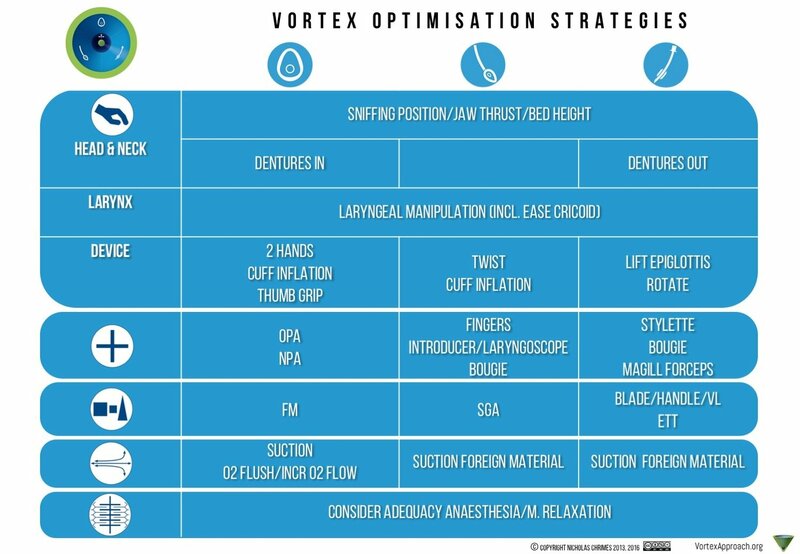 The Vortex facilitates decision making by encouraging progression through three broad categories of airway management; oxygenation via face mask, SAD or tracheal tube. An optimal attempt at each technique (‘lifeline’) should be made, with up to three attempts, before moving onto the next. 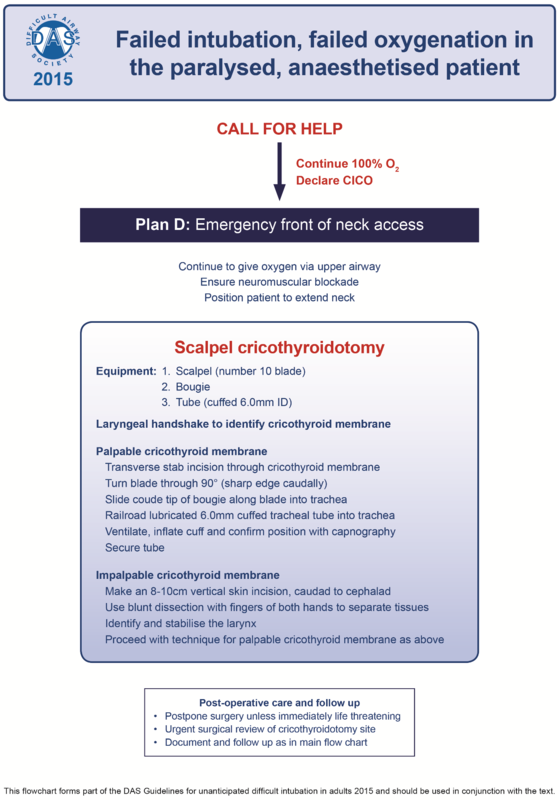 Once optimal attempts at all three upper airway lifelines have failed, emergency cricothyroidotomy (‘CICO rescue’) should be performed. Importantly, in contrast to the DAS guidelines, the Vortex approach advocates CICO resuce even if oxygen saturations are being maintained. In contrast to the DAS guidelines, the Vortex approach does not stipulate the techniques that should be used, rather the goals that should be achieved (adequate face mask, SAD or tracheal tube oxygenation, or CICO rescue). Performing CICO rescue when the oxygen saturations are 100% might seem counter-intuitive. The authors of the Vortex approach justify it on the basis that, once optimal attempts have been made using the three techniques, further attempts are unlikely to be successful, and likely to make the situation worse. They also believe that the patient is less likely to suffer dangerous hypoxia, that the operator will have more time to perform the procedure, and will be calmer while doing so. The final concept in the Vortex approach is the ‘Green Zone’. This is the horizontal ‘safety zone’ which lies outside the Vortex. 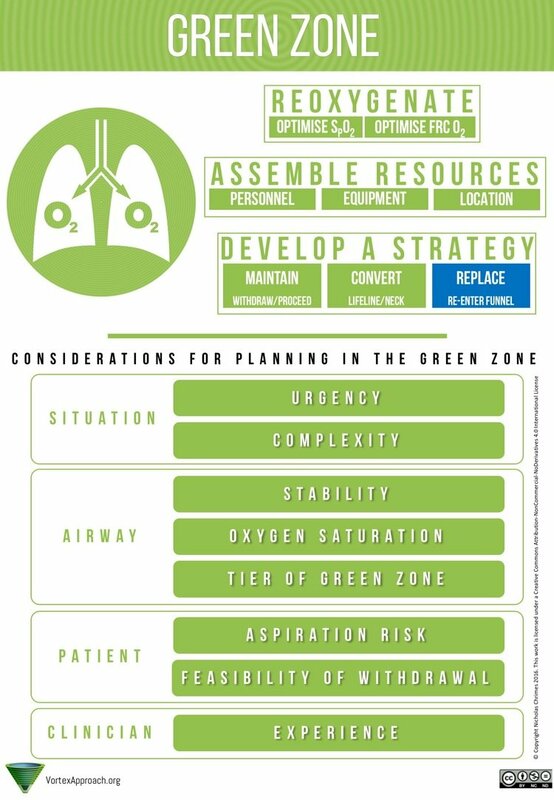 You are in the ‘Green Zone’ if you are adequately oxygenating the patient, which is defined by the presence of an end-tidal CO2 waveform and/or rising O2 saturations. If the answer is ‘Yes’, then plans need to be made to optimise or change technique. When you are in the Green Zone there is time to think, make a plan, mobilise resources and consider what will be done if the next plan fails. See ‘Considerations for Planning the Green Zone’. Why are there multiple Green Zones outside the 3D version of the Vortex? Not all Green Zones are the same. Clearly, if you have entered the Green Zone after a short period of difficult mask ventilation, which you then resolve with a simple change in head position, this is very different to having reached the green after three failed intubation attempts, three SAD insertion attempts and a second dose of muscle relaxant. You will be more stressed, with fewer options, and by definition, you are closer to performing a CICO rescue. 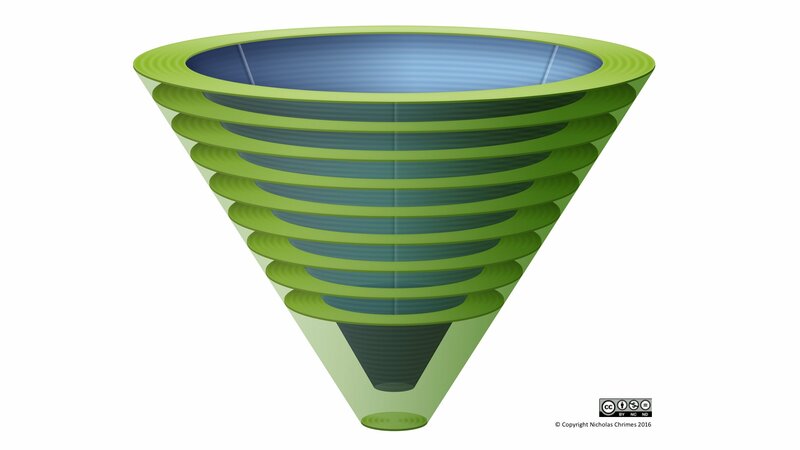 Rather than a Green Zone at the top of the Vortex, you are in a Green Zone near the pointy end. On the CCAM Course we teach that the DAS algorithm and the Vortex approach can and should be used together. 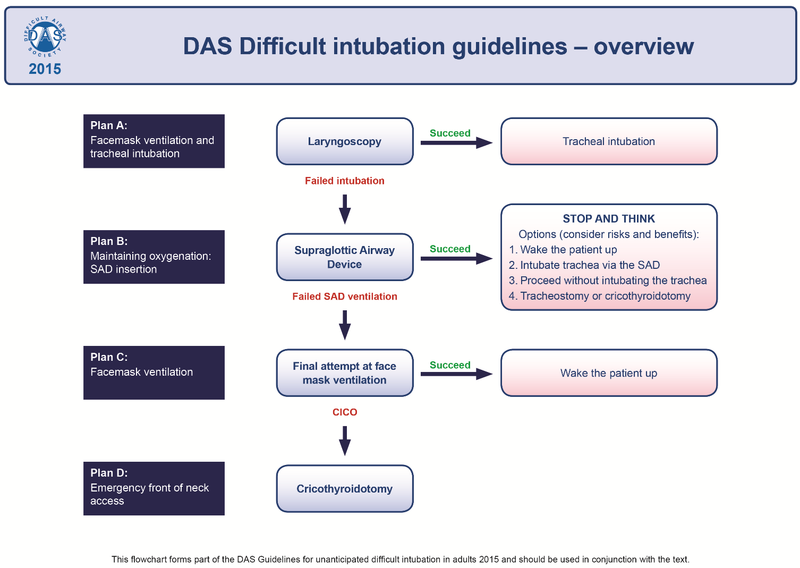 Using this approach, the DAS algorithm is used to plan the techniques to be employed during airway management, which should be voiced to the team before induction of anaesthesia in the Plan A,B,C,D format. The Vortex approach is then used as a cognitive aid to help the team to move from one plan to the next (once they have made their best effort at a particular lifeline). The combination of the DAS algorithm and the Vortex approach is especially relevant to the critically ill or injured patient, where the Vortex lifelines are used in the same order as Plans A,B,C and D of the DAS algorithm (endotracheal tube, supraglottic airway, face mask, CICO rescue). Waking critically ill patients up case of failed airway management is often not an option. Instead, following the combined DAS/Vortex approach will lead the team through Plans A, B, C and D in a familiar order. The following video was made by the creator of the Vortex, Dr Nicholas Chrimes. It portrays what might happen if the Vortex approach is used in cases similar to Elaine Bromiley’s. However, as Dr Chrimes points out on his website, it is impossible to know what outcome would have resulted from this approach in Elaine Bromiley’s case and the video is purely fictional. Intubation checklists are designed to be used as a final check, before the induction drugs are given. As such they resemble the operating theatre ‘Time out’. The checklist should be commenced when all members of the team think they are ready to proceed. Team members should all be quiet and listen, with the most appropriate person responding to each challenge-response question. For example, the airway assistant would answer the questions about the airway equipment; the drug administrator the questions about drugs. It is acceptable for more than one person to answer the ‘Yes/No’ questions for the sake of speed. When used in this way, the checklist should take less than a minute to complete. If you have a minute to spare (i.e. the patient is not in extremis), then it is time well spent. Checklists can also be used by individual team members as an aide-memoir, to help them prepare the patient, drugs and equipment. It’s a good idea to have a few copies of the checklist available to allow for this. 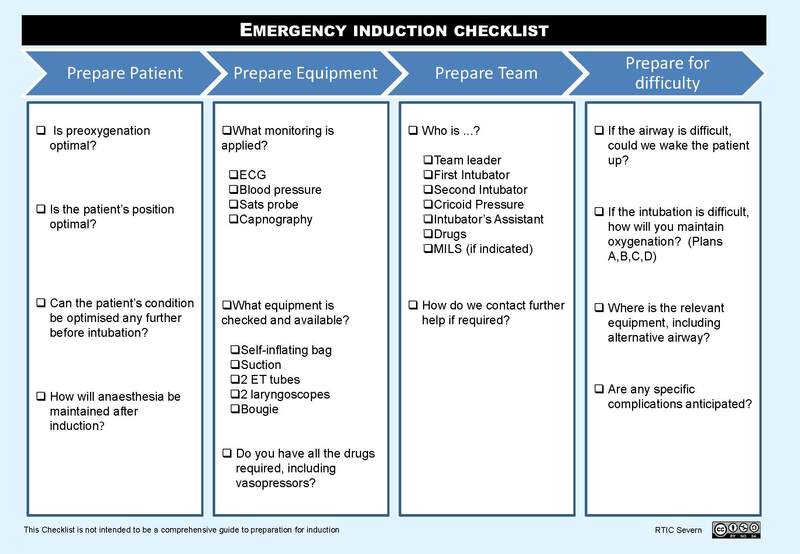 Two examples of intubation checklists are shown below. The first is from from Australia and the second from the UK (see www.saferintubation.com). 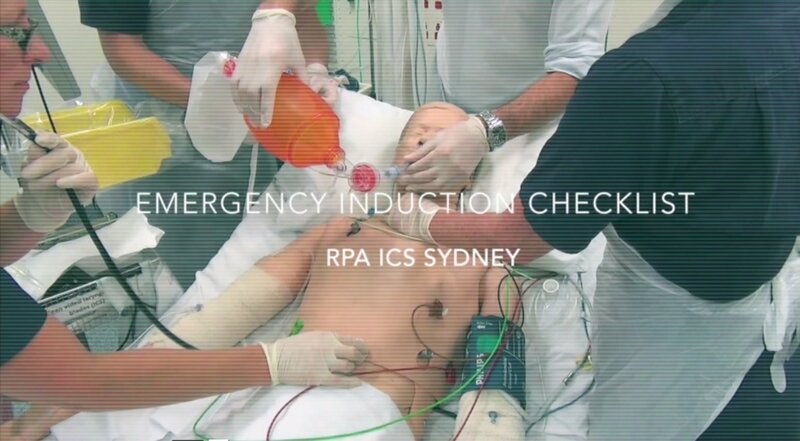 See also the video from RPA ICU in Sydney, showing their intubation checklist in action. Greenland KB, Acott C, Segal R, Goulding G, Riley RH, Merry AF. Emergency surgical airway in life-threatening acute airway emergencies–why are we so reluctant to do it? Anaesthesia and intensive care. 2011;39(4):578-584. Mort TC. Emergency tracheal intubation: complications associated with repeated laryngoscopic attempts. Anesthesia and analgesia. 2004;99(2):607-613, table of contents. Cook TM, MacDougall-Davis SR. Complications and failure of airway management. British journal of anaesthesia. 2012;109 Suppl 1:i68-i85. Harmer M. Independent Review on the care given to Mrs Elaine Bromiley on 29 March 2005. (2005). Available: http://www.chfg.org/resources/07_qrt04/Anonymous_Report_Verdict_and_Corrected_Timeline_Oct_07.pdf. Hill C, Reardon R, Joing S, Falvey D, Miner J. Cricothyrotomy technique using gum elastic bougie is faster than standard technique: a study of emergency medicine residents and medical students in an animal lab. Academic emergency medicine : official journal of the Society for Academic Emergency Medicine. 2010;17(6):666-669. Chrimes N, Fritz P. The Vortex Approach: Management of the Unanticipated Difficult Airway. 2013. Available: https://www.smashwords.com/books/view/277513. 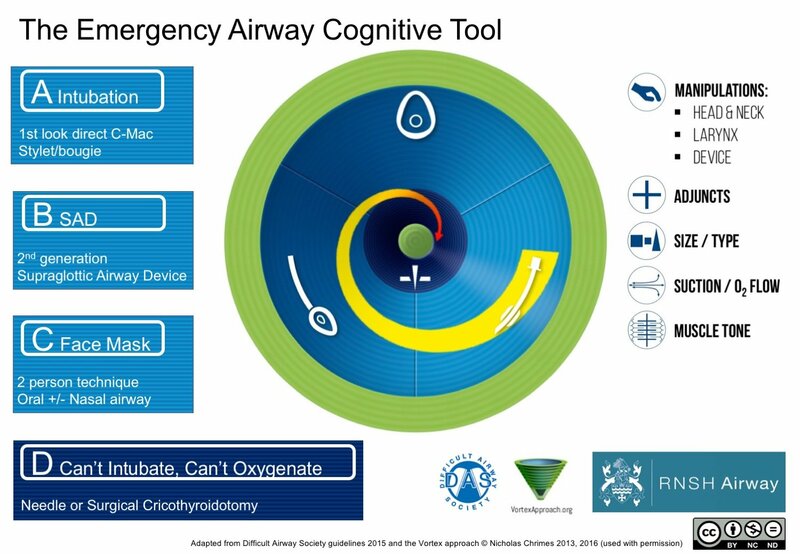 Sillen A. Cognitive tool for dealing with unexpected difficult airway. British journal of anaesthesia. 2014;112(4):773-774. Fogg T, Annesley N, Hitos K, Vassiliadis J. Prospective observational study of the practice of endotracheal intubation in the emergency department of a tertiary hospital in Sydney, Australia. Emergency medicine Australasia : EMA. 2012;24(6):617-624. Bowles TM, Freshwater-Turner DA, Janssen DJ, Peden CJ, Group RS. Out-of-theatre tracheal intubation: prospective multicentre study of clinical practice and adverse events. British journal of anaesthesia. 2011;107(5):687-692. 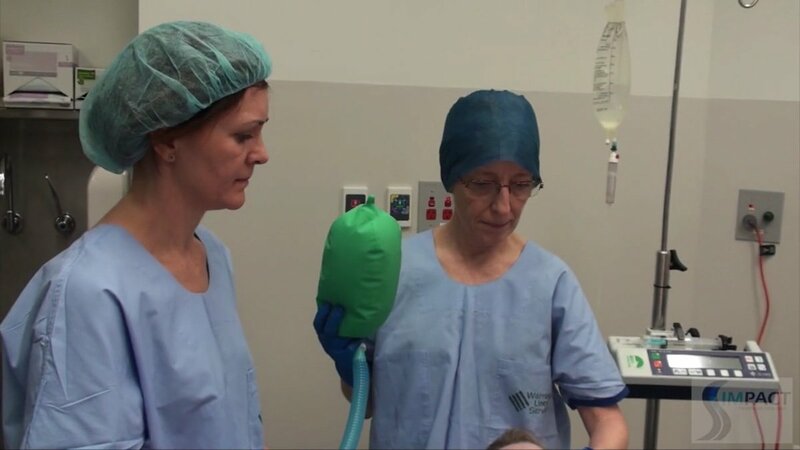 Phillips L, Orford N, Ragg M. Prospective observational study of emergent endotracheal intubation practice in the intensive care unit and emergency department of an Australian regional tertiary hospital. Emergency medicine Australasia : EMA. 2014;26(4):368-375. Conroy MJ, Weingart GS, Carlson JN. Impact of checklists on peri-intubation care in ED trauma patients. The American journal of emergency medicine. 2014;32(6):541-544. 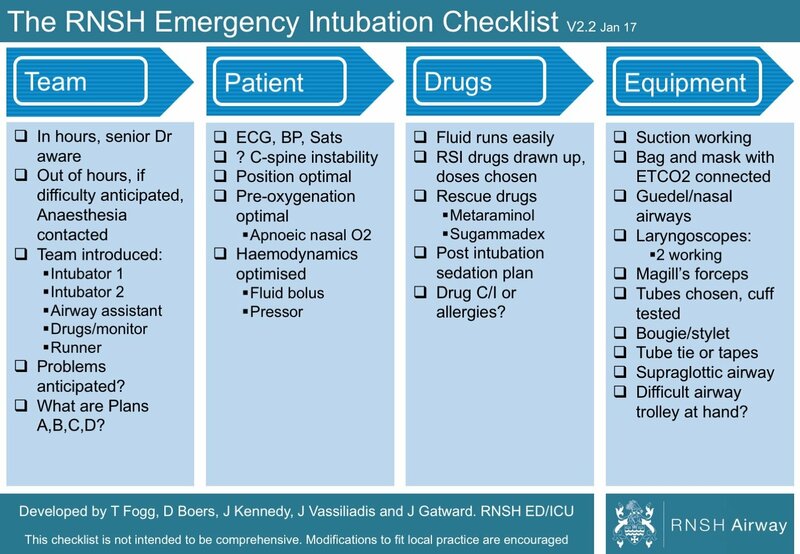 Babolhavaeji F, Rees I, Maloney J, Walker, J, Knights M. Checklist for emergency induction of anaesthesia in critical care. Anaesthesia, 2013; 68: 661. Jaber S, Jung B, Corne P, et al. An intervention to decrease complications related to endotracheal intubation in the intensive care unit: a prospective, multiple-center study. Intensive care medicine. 2010;36(2):248-255.